Trevor Leggett’s teacher of Yoga and its philosophy was the late Dr. Hari Prasad Shastri, pandit and jnani of India. Dr Shastri was commissioned by his own teacher to spread the ancient Yoga abroad, which he did in China, Japan and lastly for twenty seven years in Britain until his death in 1956. The Yoga is based on the Upanishads and the Bhagavad Gita but is to be spread on non-sectarian and universal lines. It has a clear-cut philosophy and training method. Trevor Leggett was his pupil for eighteen years and was one of those entrusted with the continuation of Dr. Shastri’s mission. All Leggett’s books on spiritual subjects are dedicated to his teacher. Trevor Leggett had lived in India and Japan and knew Sanskrit and Japanese. From 1946 for 24 years head of the BBC Japanese Service broadcasting in Japanese to Japan twice a day. He was a translator and author of some thirty books mostly on Eastern and Far Eastern yoga and Zen, with some cross-cultural studies. Three of them in Japanese. He also held the rank of 6th Dan in Judo from Kodokan, Tokyo and 5th Dan in Shogi, Japanese chess. 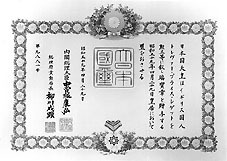 In 1984 he was awarded the Third Degree of the Order of the Sacred Treasure, by the Emperor of Japan, in recognition of his services to cross-cultural relations between East and West, through broadcasting, translations and other books, and through active introduction of aspects of Japanese culture to the West. There are eight degrees of this Order, from the First down, and this is the Third Grade, which is in practice the highest a private individual can get. In 1987 he was awarded the All-Japan Buddhist Association Literary Award for Translations of Japanese.